Philly bound!! (What I did this weekend!) — Comics by Haemi! 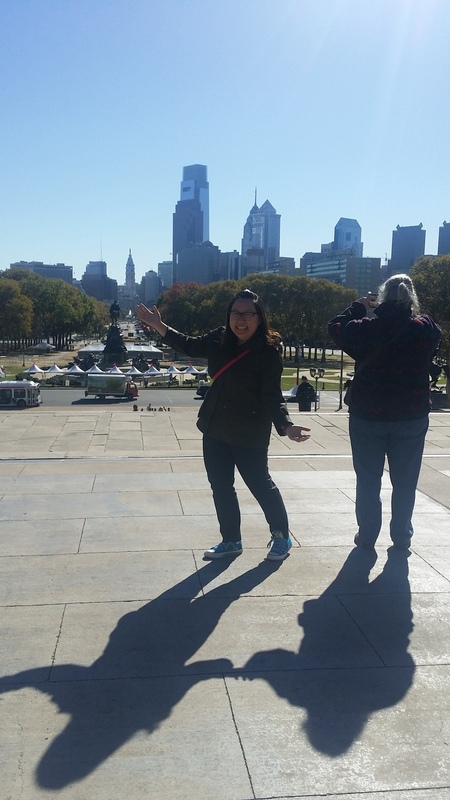 To celebrate the beginning to a new start, I decided to take an impromptu trip to Philly! I got to to say Philadelphia is a great city to do a one day trip at- it cost basically nothing! It was fun to see all the fun attractions- like the steps that Rocky ran up... thought I'm sure the real reason he ran up those stairs was because he really wanted to see the museum! hahah! Then after, I did the tradition of eating at Jim's, went window shopping and tested out many bathrooms! (Cause I'm old and nature is my best friend who calls on me constantly!! There was one difference that happened... I TRIED WAWA FOR THE FIRST TIME!!! Totally worth it!!! LOOK HOW HAPPY I AM!! Seriously... now that I'm writing this entry, I want another hoagie... UGHH WHY CAN'T MY DREAMS COME TRUE?!? !